This curry is one of my staple winter meals, it's so tasty and super easy too! I love that you can add whatever veggies you have in the fridge and turn it into a nourishing meal. Chickpeas are a great vegetarian source of plant based protein. Regardless if you follow a vegetarian diet or not I think it is important to include 1-2 meat-less meals into your diet each week. However, you can totally turn this into a non-vegetarian meal by adding your favourite animal protein source. I have made this curry before using chicken thighs and it was amazing! Substitute the broccoli and peas for any of your favourite vegetables. Eggplant, cauliflower and brussel sprouts are also delicious in this curry. I love using a slow cooker for this recipe as it make it super easy (and the house smells amazing!). However if you don't have a slow cooker, use an oven proof dish and bake for 60-90 minutes. Add the tinned tomatoes, coconut milk/cream, garlic, ginger, curry powder and miso paste to the slow cooker. Mix to combine. 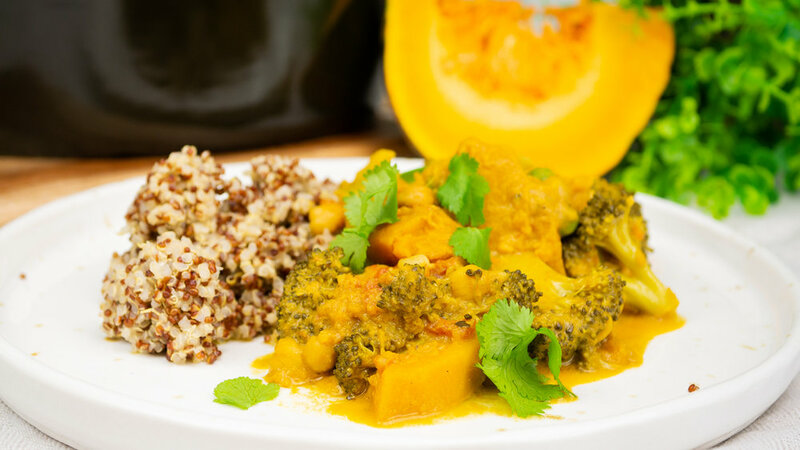 Mix in the pumpkin, broccoli and chickpeas. Half an hour before serving mix through the peas and season with salt. Serve with quinoa or brown rice as an option. Join 9k incredible ladies in our private Facebook Group and receive your copy of our FREE 7 Day Mind & Body Experience eBook. By signing up, you'll also receive a weekly e-mail with new delicious recipes and healthy tips.